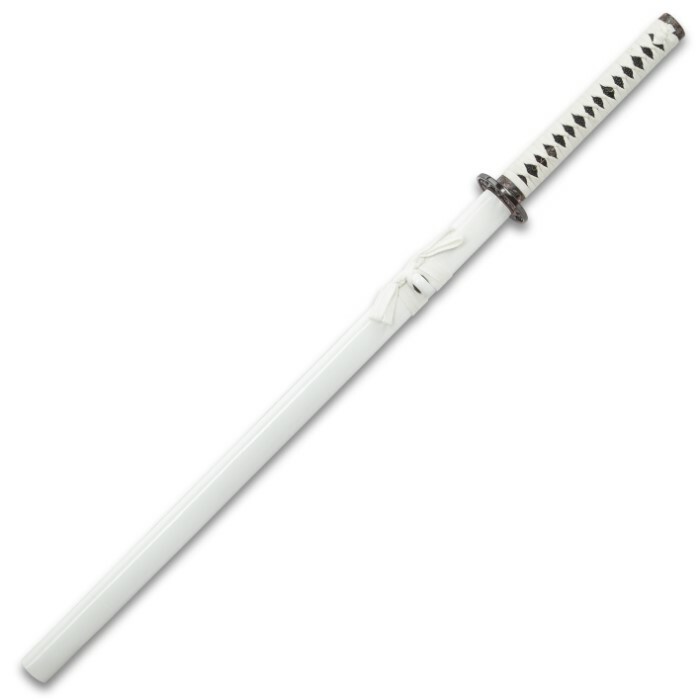 Whether you need to remain cloaked amid snow or just appreciate the striking contrast of polar white ito and black Damascus steel, the Arctic Shadow Ninja Sword has you covered! 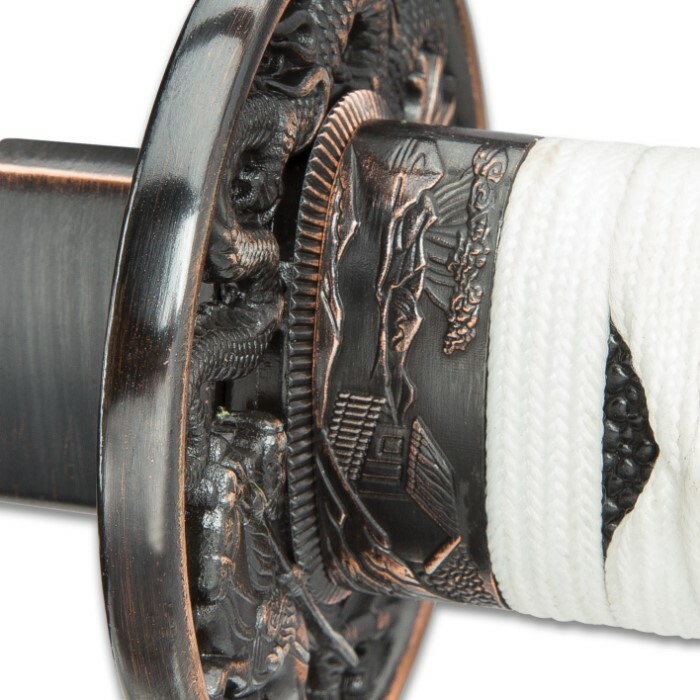 The design and functional elements of this katana work in harmony. Full tang, battle ready and hand honed sharp, the blade features 1024 powerful layers of folded steel. The black finish allows for easier viewing for the layers. Shinwa swords are made by hand using traditional methods in the ancient sword-making township of Lonquan. The sword-making history of this town can be traced back to the twentieth year of the Guangxu in the Qing Dynasty ­ exceptional sword making continues there still today. The swordsmiths of Lonquan can apprentice for up to six years before they begin to forge these functional works of art on their own. 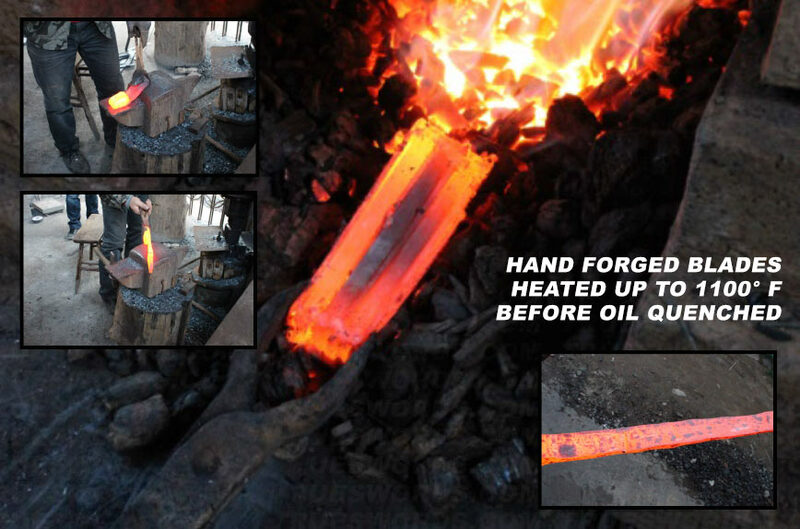 Each Shinwa sword is hand forged at temperatures of up to 1,100 °F and continuously heated, folded, hammered and shaped before being oil quenched and then straightened. Damascus steel blades are folded as many as ten times to yield up to 2,056 layers of premium Damascus steel. After quenching the blade is then ground and hand sharpened and polished by the swordsmith on a series of wet stones. Each set of these wet stones contains a finer level of silicate particles, which produces an even sharper edge. 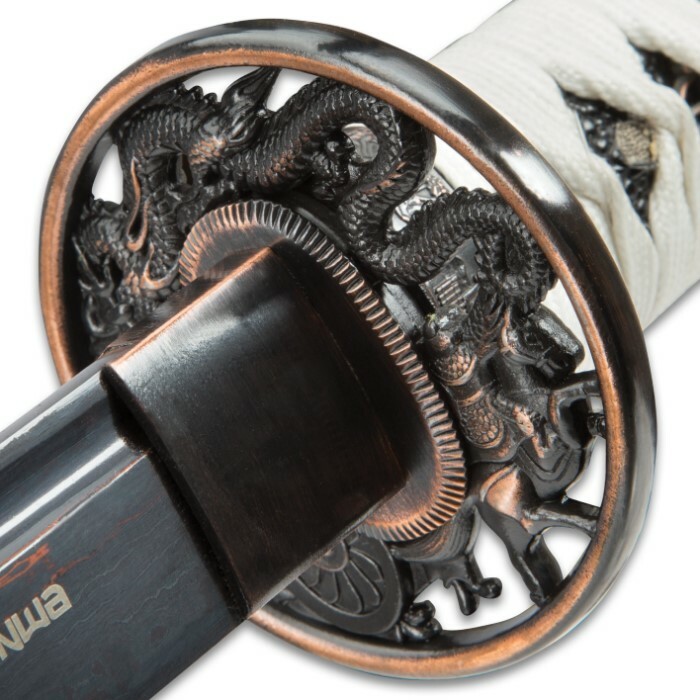 In the final stages of this painstaking process, the tsuka is wrapped and tsuba and other fittings are added before a thin coat of oil is added to the blade to prevent corrosion. Don't get me wrong I love this sword, I just didn't know what I was getting was a chopper. This is my second shinwa and difference is very obvious too say the least. The odd thing is it cuts soft things better than like say paper but the edge is made for durability not sharpness. I was trying to get identical swords but reverse colors, like ying yang swords, but this one is bigger, beefier, and still worth it. Even if this is to be for the cuts down trees with katans kind of people, I love my over glorified machete none the less. Full tang, well made. Sharp out of the box and very beautifully crafted. Saya fits tight, the handle is solid, weight feels perfect in my hand. There are some tiny imperfections in the crafting, but it's handmade, I call it personality. Thanks Shinwa and True Swords for a great deal on a nice blade. Already shopping for another! Nice looking sword. I decided on this one just because of the blade. Very disapointed when i found out it is only a coating! Wether it is damascus or not you will never know unless you can somehow remove the coating. Still a decent piece, just wished it was described differently. And not very sharp! 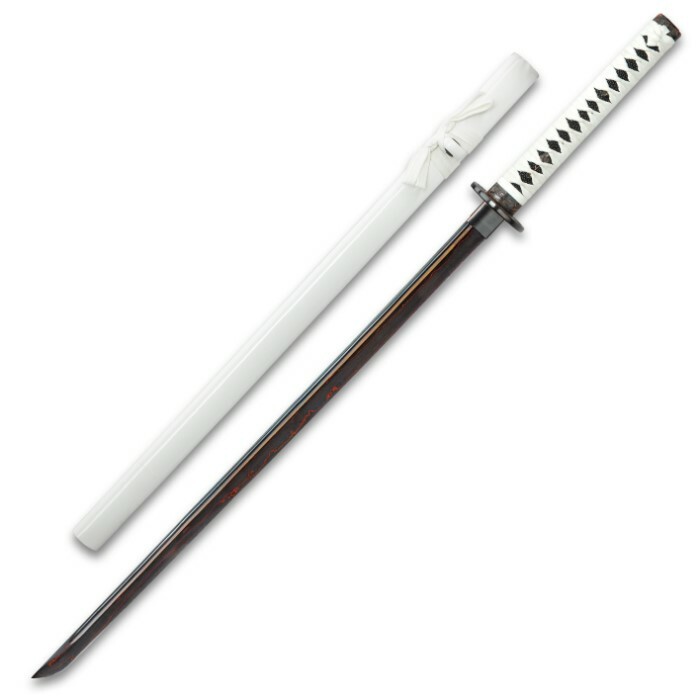 Folks, this is $129 Katana. So what do you expect? Well, I expected close, but probably not perfect. What I received is actually a very nice sword indeed! 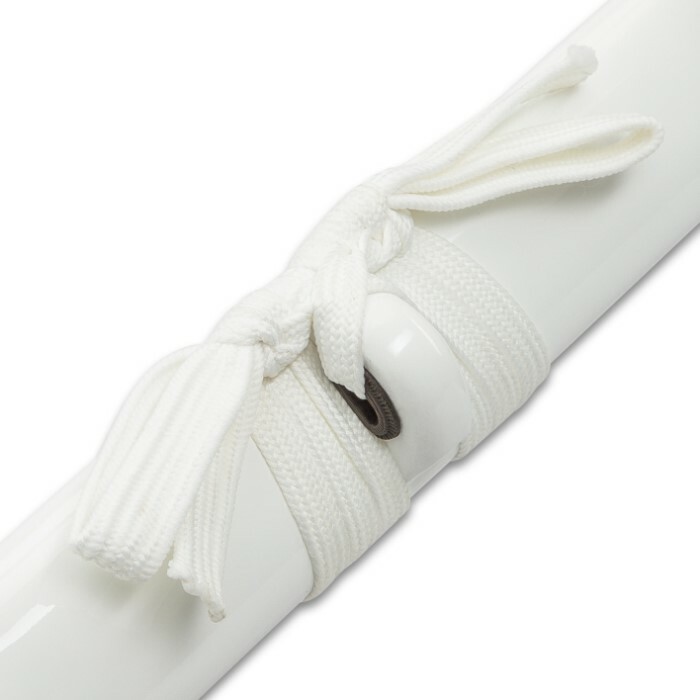 The blade is perfectly true, the handle and white lacquered scabbard are very nice quality and to look at. And it appears very solid. You can argue all day whether the mimicked modern Damascus forging process versus high carbon steel is better. But it doesn't matter. For $129 you will get a sweet sword that is very solid. It's mass produced so I wouldn't compare it to any true craftsman's hand-forged blade, but I'm guessing it would hold up quite well if put to the test. Beautiful black marbled Damascus blade, white scabbard and wrap...its a sweet look. 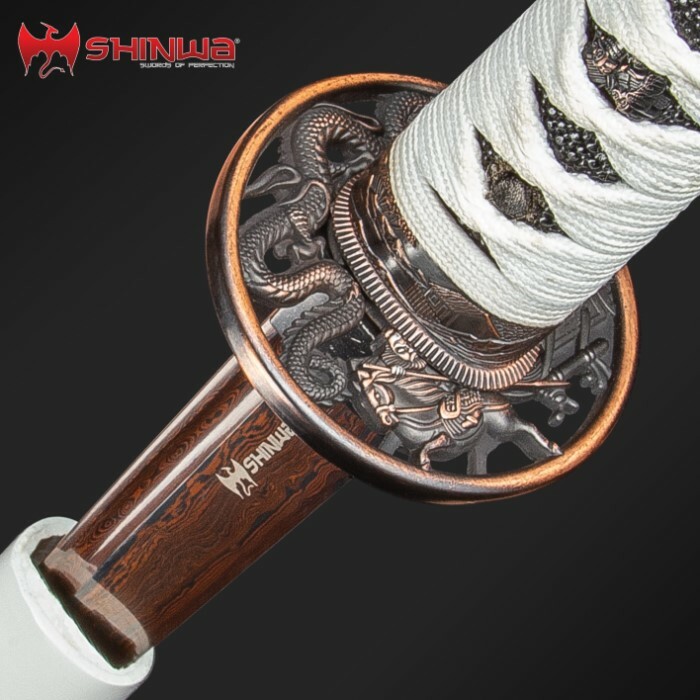 I researched these Shinwa blades on other sites since I'm not a sword purest, nor do I want to pay $1500 for an elite blade. They have decent reviews, even from people claiming to be sword-smiths and enthusiasts. It's like everything else...there are different levels of product. This isn't your Porsche 911, but it IS your Ford Mustang GT! See what I mean? It's not black and white (the subject matter, since the sword colors actually are black and white, lol...like it's either fantastic or junk. It's a great sword. 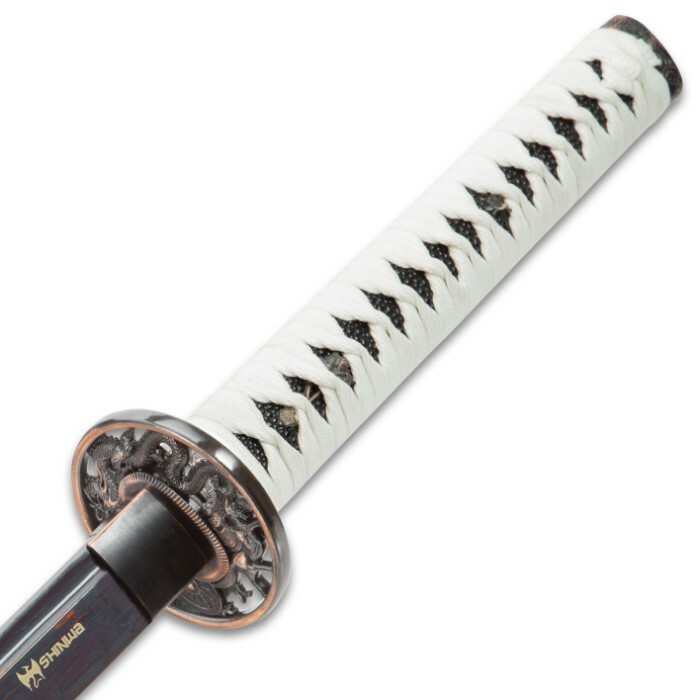 Bottom line: I haven't defended my homestead against Samurais or zombies (and yes, I WILL be ready...lol), but this sword is beautiful and elegant, very sharp, and appears fairly well balanced. Its PERFECT for the price (you may have seen that written somewhere lol). I did like another reviewer suggested and kept the plastic wrap on the white cording on the handle to keep it from getting dirty. Awesome sword BudK. Thank you! I was very happy with this sword. It is very sharp, balanced, and the blade was cooler looking than I was expecting. It will look great in my collection and has some functionality to go with it. All in all, one of the best swords I've purchased. Very nicely balanced. Not too heavy or light. Will enjoy this. Was somewhat disappointed to find out that the sword wasn't sharpened all that much. Was enough to feel a bit, but not for cutting anything. It's a nice sword, but mine was not razor sharp out the box like others say, it couldn't cut through a plastic bottle, but stabbed through it nicely. 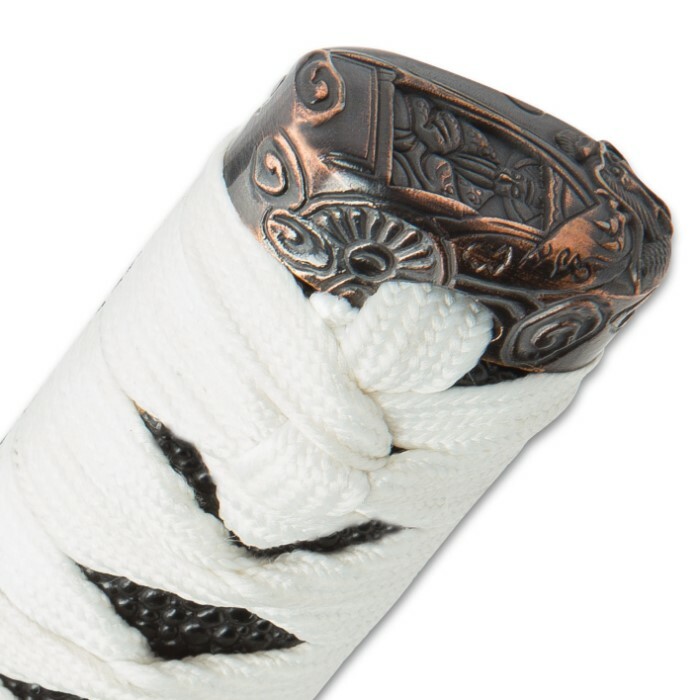 The scabbard is really soft wood and dings easily. Also I was hoping for an authentic Japanese sword, and was disappointed to see handcrafted in CHINA on the blade. I am happy that it is handcrafted, and it has a very nice weight to it. As for stabbing through a zombies head it'll defiantly do nicely. And with a good sharpening I'm sure it'll slice them up too. Over all it is a very nice sword, very thick and heavy blade, won't bend easily. I really love it, despite any minor flaws. This was a gift to me, The handle wrap is not silk so it moves if used a lot, but the blade is very sharp and weighted well... I suggest getting if you have not bought a real sharp katana and payed with it. it is an okay sword very nice to look at but there are a couple things wrong the handle wrap is a little loose and the metal on top and bottom of the guard is not held together all the way it kind of rattles a little bit but it is still a very nice sword to own i love the weight it deffinately could cut a zombie down. It's not full tang, probably closer to 2/3 to 3/4, which is fine. The balance is off, but it is pretty to look at. 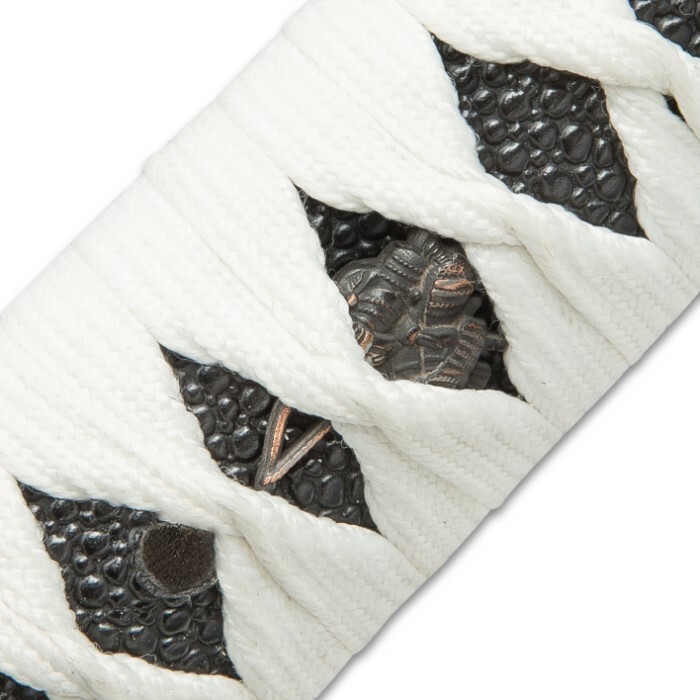 My two complaints are first the "same" of the "tsuka" seems to be plastic, second the steel seems to be some sort of "pot" metal. Not sure if it has a high tin content or whatever but, meeting my other forged swords edge on edge would crack it for sure. So great for zombies, bad for invading Europe, great to look at. As far as whether it's a "ninja-to" or a katana, historically it can be both. But that debate is about as relevant as a broadsword or claymore debate. Kinda' depends on the one holding it I guess.